A 2014 Cybils Award Winner! Behold and welcome to Andy and Preston’s very first adventure! Andy is Preston’s best friend. Preston is sure of this. Is Preston Andy’s best friend? Hmm...that is much harder to tell. Is Andy okay? Preston always thinks Andy is super-okay! Does Andy think Preston is okay? Maybe... but he will NEVER admit it! One thing for sure, they spend a lot of time not catching rabbits, falling over cliffs, and trying to decide the difference between an owl and a bear. And that’s just in the first book! Okay, Andy is this series’ debut title in Blue Apple’s Jump-into-Chapters series. For kids who want to tackle a “big kid” book, but aren’t quite ready for text-heavy reading, Jump-into-Chapters offers a perfect bridge—and a pair of buddies they’ll want to follow. Sharply funny and engaging, Andy and Preston offer emerging independent readers a lot of story, told in an easy-to-read style, and without too many words. What’s next? 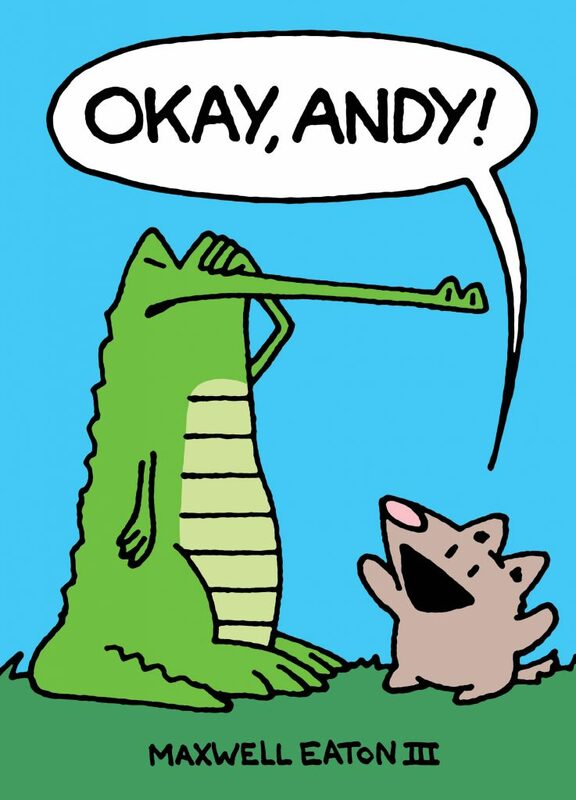 The pals also star in Andy Also!—in which Preston sort of pays homage to Andy. About Jump-into-Chapters: These books are designed to fill an important gap in reading materials. It’s important to have books that challenge the new reader to remember what happened more than 80 pages after he/she began. Best of all, each of the books features fresh-and-funny, character-driven stories. Kids will feel like they’ve made some great new friends who reflect their lives and feelings, book after book. 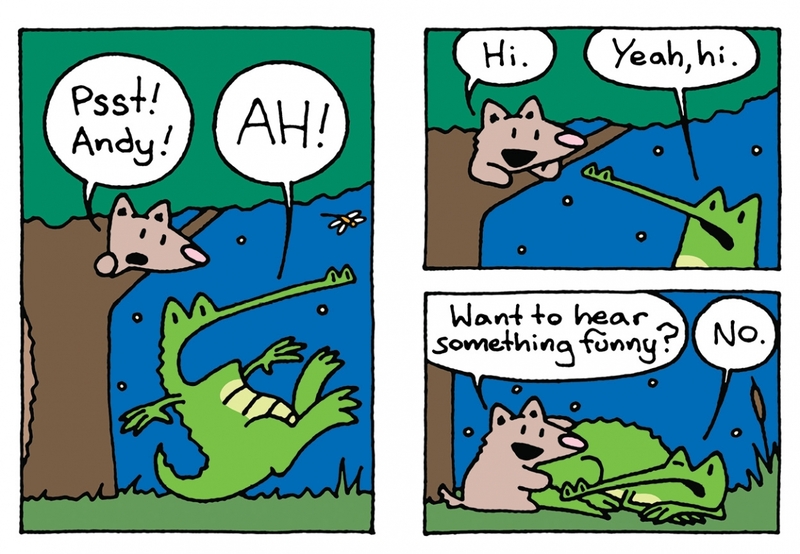 ★ From the Max and Pinky books to Two Dumb Ducks, Eaton loves a comic duo, and he’s got a great one in a wildly excitable coyote named Preston and his beleaguered alligator friend Andy. In this graphic novel–style chapter book, which helps launch the Jump Into Chapters line, Preston thwarts and annoys Andy at every turn. The first chapter finds Andy stalking a rabbit, only to have Preston scare it off. “What are we doing?” Preston asks, peering through foliage. “We are doing nothing,” replies Andy. “But it seems like we are doing something,” persists Preston as the rabbit peers down at them from a tree. Eaton’s chunky drawing style, clean backgrounds, and simple speech-balloon dialogue keep the panels uncluttered and the action easy to follow. 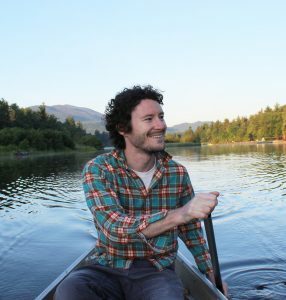 In the second chapter, Preston’s constant question, “Okay?” eventually drives Andy off a small cliff; in the third, Preston tries to make Andy guess what animal sound he’s making (“A rock.” “No.” “A shoe.” “No”). Whether readers are the “Preston” or “Andy” in their own friendships, they’ll find this duo’s interactions irresistible. Welcome to a new series created to bridge the gap between read-to-me books and read-on-my-own books! Harriet Ziefert, Blue Apple’s publisher and founder, was among the pioneers in creating early readers that help kids transition into becoming independent and successful readers. A crucial step in this process is to offer books with more pages and more plot, while retaining a spare word count and text style. Enter Jump Into Chapters, a new series of books created to transition readers from picture books to text-heavy chapter books. The first three books in the series have between 72 and 96 pages, but very few words per page. In short, the page count increases, while the word count remains low. These books are designed to fill an important gap in reading materials. It’s important to have books that challenge the new reader to remember what happened eighty pages or more after he/she began. Best of all, each of the books features fresh-and-funny, character-driven stories. Kids will feel like they’ve made some great new friends who reflect their lives and feelings. Maxwell Eaton III, creator of the Max and Pinky books and The Flying Beaver Brothers graphic novels, has earned starred reviews and kudos for his hilarious writing and witty illustrations. Visit his website at www.maxwelleaton.com.